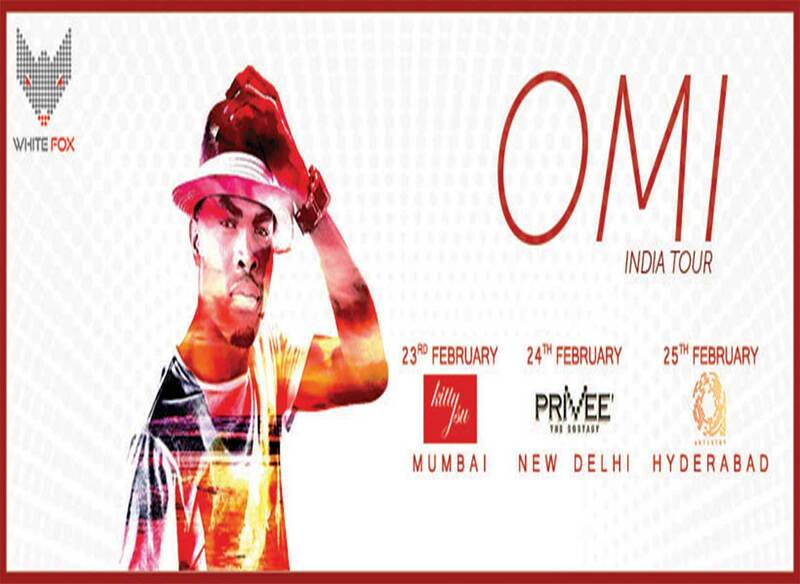 White Fox India, the New Delhi Based event management company that grabbed headlines when they brought Justin Bieber to the country for the very first time is gearing up to bring OMI to India for a debut showcase. After Bob Marley, 31-year-old OMI is the first Jamaican singer-songwriter who triggered a global musical tide. His chartbuster single “Cheerleader” was officially hailed as “Song Of The Summer” by Billboard after a lengthy six week reign at the #1 spot on Billboard’s Hot 100 chart. It snagged an incredible 800 million combined video views and was streamed over 400 Million times on Spotify. The unstoppable hit notched platinum-plus sales in the UK, Sweden, Italy, Germany, and Australia, 3X platinum certification in Spain and Diamond certification in France. A praiseworthy follow-up to Cheerleader, OMI delivered Hula Hoop in his debut album “Me 4 U” that garnered over 100 million views and a platinum certification. The album also features tracks like “Stir It”, “Drop In The Ocean”, “These Are The Days”, “Hitchiker” and “Babylon”. The affable singer/songwriter, who hails from the rural Jamaican parish of Clarendon – ‘a stone’s throw from Kingston’ pursued his interest in music from the age of 14 years. He has worked with A-list artists like Felix Jaehn, Shaggy, The Vamps, Kid Ink, Taylor Swift and Avril Lavigne and is a frequent caller of major music award ceremonies all around the world. Mr. Keshav Suri( Kitty Su India) says, "Omi has a major fan following in the country and we at Kitty Su are extremely excited to be a part of his Debut Tour and host him at our club. We are sure that Mumbai will give him all the love." Adding on Arjun Jain, Founder, White Fox India states, "OMI has a huge fan following in India and after a lot of fan requests we decided to bring him to the sub-continent for the very first time for a three city showcase. In addition this year we plan to host a bouquet of commercial acts who haven't performed in the country before."